Day 1: Drive to Martselang and reach Hemis National Park. Day 3: Ascend to Kongmaru La and descend to reach the campsite of Thachungtse. Day 4: Walk through the Langthang Valley to the reach the camp at Yakrupal followed by meals. Day 5: Proceed to Zalung Karpo and descend to reach the camp of Tilat Sumdo. Day 6: Walk towards a cluster of rocky needles to reach the camp at Charcharla(Jung Lam) base. Day 7: Ascend to the top of Charchar la(Jung Lam) and return to the base base to reach the campsite of Zangla Sumdo and relax for the night. Day 8: Reach the Zulung valley and proceed for sight-seeing. 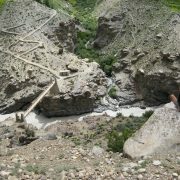 Day 9: Cross the Zanskar River and arrive at Karsha. .
Day 10: Reach Pipiting village. Relax for the day and drive back to Leh. Day 11: Drive towards Kargil,and pass through the villages of Shakar and enjoy the view of Nun and Kun mountains before reaching Kargil. Day 12: Return back to Leh. Leave Leh by jeep to the starting point of the trek at Martselang 3600 m.
En route we will visit the first Palace of Ladakh at Shey followed by a visit to the famous Yellow Sect monastery of Thikse, which houses one of the biggest Buddha sculpture known as the future Buddha. We visit Hemis, the biggest and the most famous Drukpa monastery of Ladakh, built in the early 17th century. After the visits we will drive to Martselang and start our trek to Shang Sumdo, a small village at 3700 m.
Martselang is the entry point into the Hemis National Park in which we may see endangered high altitude animals like Snow leopard, Tibetan Wolves, the great Tibetan Sheep and the Golden Eagle. On this day, we trek through the gorge of Shang, ascending gradually and enjoying the magnificent colors, shapes and rock formations of the gorge. We will pass along the small village of Chogdo before arriving at camp at Lartsa (4600m). A steep ascent leads us up to Kongmaru La 5200 m.
From the pass we will see a breath taking view of Kangyatse(6400 m), Zanskar and the Karakoram ranges. Then we descend gradually to the summer pasture of Nimaling, where the villagers of Marka valley stay during the summer season with their sheep, goats and yaks. The campsite of Thachungtse (4000 m) is further down the valley on the banks of the Marka River. After the previous days strenuous walk, this days walk is easier as we walk through the remote Langthang valley, where few other tourists go. Only the villagers from Markha, who use this valley as a pasture ground for their sheep, donkeys, yaks and horses. From Thachungtse, we follow the valley down until it divides, cross the river and follow the valley to the left along the Langthang Chu River. The Langthang River has the tendency of rising during the day due to snow melting in the mountains and by noon it becomes a dangerous river to cross. An early start in the morning is therefore essential, as one has to cross the river several times. Yakrupal (4200 m) is a nice, green campsite where we will have a good meal with the horses grazing close-by. We will continue up the valley towards the pass of Zalung Karpo(5200m). From the top of the pass there is a spectacular view of the Zanskar range on the one side, while on the other, the highest plateau in the world appears, the Changthang plateau stretching far into Tibet. The only inhabitants of the Changtang are nomadic and semi-nomadic people, living in tiny settlements with their animals and a small harvest of barley on which they survive. Descending down from the pass, several river crossings will follow and lead us to the right bank of the Changchu River and the camping site of Tilat Sumdo (3750m). At the crossroads of Tilad Sumdo, its worth exploring some of the secluded gorges nearby. If fortune strikes there are chances of seeing wildlife around, including blue sheeps and the rare snow leopard. On this day well have more river crossings than any other day. 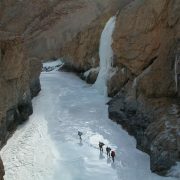 The day starts with crossing the icy cold river of Changchu and entering into a beautiful narrow valley until a canyon. After several river crossings, the valleys narrows and crossing the river becomes much easier. Walking further leads us to a plate with stones opposite a cluster of spectacular rocky needles where two cold streams intersect. Following the stream will reveal several impressive gorges. After the third narrowing gorge, leaving the stream towards the left we finally ascend gradually to the top of Charchar la(Jung Lam) (4950m). From the pass we will have a fine view of the main Himalaya beyond Padum. We descend steeply along glacial steps to the base of the pass. After crossing a magnificent canyon towards the left as far as the intersection along the stream to the large river at the campsite of Zangla Sumdo, well have a very beautiful campsite to relax for the night. With many river crossings downstream into the Zulung valley, we sight the first Zanskari village amidst the greenery of barley fields. The trail goes gradually up as far as Zangla castle and then down for half an hour beyond the chortens (stupas), bringing us to the village of Zangla (3370 m). Until 1989, Zangla had its own ruler with control over the nearby villages of Honia, Chazar, Hanumil, Pidmo and Pishu on the far side of the valley. Zangla monastery has its legacy with the Spituk monastery of the Gelugpa sect. Our day begins with crossing the longest hanging bridge over the Zanskar River. 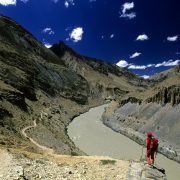 From Pishu the trail ascends gradually to the village of Rinam (3550 m), following the banks of the Great Zanskar River. Along the way, well see the stunning monastery of Tongde. 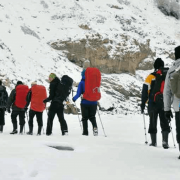 Thereafter we will arrive at Karsha (3600 m) and reinvigorate ourselves at the banks of the Zanskar River listening to the musical tune of the flowing water. Karsha monastery is one of largest monasteries of Gelug pa sect. It is on the hillside with imposing view of the entire valley. Most of the monks are from the surrounding villages. It is believed that the monastic site was founded probably around 10th century A.D. It is recommended to visit the monastery to get a blessing. We will follow the route to Pipiting village on the dusty road from Karsha to Padum (3531 m). 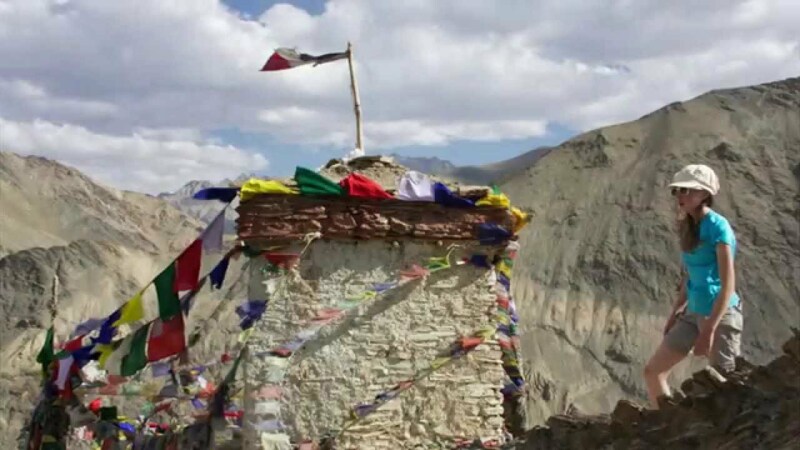 Padum is the major hub for all the activities of the entire valley and the capital of Zanskar. Here all villagers gather on auspicious days. After arriving at Padum, we once again intermingle with civilization for a day, and it is the time to a have a complete rest before preparing for the long drive back to Leh. We drive towards Kargil, passing Sani monastery (6 kms) after turning west and cross the Doda River at Dhungri. We will be driving along the right bank of the River. Further on, we will cross a beautiful valley covered with comprehensive green patch. 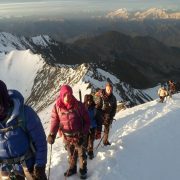 Between Padum and Aksho, we will come across a few small villages: Dhungri, Phay and Hamuling. As we pass, we will be slowly leaving Zanskar valley and Drang Drung Glacier beside the Penzila. In the middle of the next valley, we can see Rangdum monastery situated on a rock hill. After that we will pass through the villages of Shakar, Parkachik and Panikhar. At Thangbu village, around 12 kms before reaching the Panikhar, we can have an incredible photographic view of Nun (7135 m) and Kun (7080) mountains before reaching Kargil.